30th Anniversary Annual Donnie Smith Show. More Custom Bikes, Cars, Parts and Tattoos. 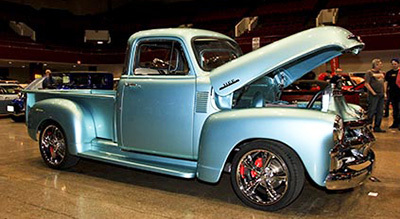 In its 30th year, the Donnie Smith Bike and Car Show presented by Dennis Kirk is the largest custom bike and car show in the Midwest. The show draws some of the nation’s most prestigious brands, top competitors and tens of thousands to the RiverCentre in Saint Paul, Minn. It is widely known as the annual kickoff to the riding and cruising season and features a unique mix of competitions, shopping and entertainment in a fun, family-friendly environment with 35 classes of custom motorcycles, 16 classes of cars, one of the largest swap meet on the planet, a tattoo expo and other entertainment. Right now, anyone, from amateur to pro, can enter a custom project, register to sell goods or set up a tattoo display at Donnie Smith Bike Show. All events will take place at the St. Paul RiverCentre in St. Paul, Minn., 9 a.m. to 7 p.m. Sat., March 25 and 10 a.m. to 5 p.m. Sun., March 26, 2017. Outrageous Motorcycles. Well over half the show, 135,000 sq. ft., will be dedicated to motorcycles, paying homage to the machines that started the show in 1987. Over $7,500 in cash awards will be presented to the top baggers and customs with awards also given for best paint, display, lighting, antique, bagger, bobber, chopper, pro-street, sport bike and a judge’s choice. Some of the biggest guns in the biker world including Donnie Smith, Rod Woodruff, Kevin Baas and the Kennedy High School Chopper class, Dave and Jody Perewitz and Pat Patterson will be in attendance. The inclusionary show allows anyone to enter. Enter the bike show by filling out the entry form located HERE. Deadline for entry is March 10, 2017, but the show historically sells out, so early entry is encouraged. Gigantic Swap Meet. The parts extravaganza, which covers nearly an acre, is a huge attraction. This is an opportunity to find missing parts and get those bikes and cars ready for the road this spring. Cruising season is just around the corner. It’s a motorcycle part pickers paradise. New Tattoo Expo. 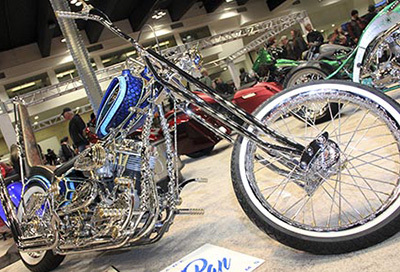 New this year, the Donnie Smith Bike & Car Show is offering a Tattoo Expo. The event will expose new talent, showcase proven artists and provide enthusiasts with a gathering place to share their love for this enduring art form. The Tattoo Expo will be located in the upper level of the Roy Wilkins Auditorium. Those interested in reserving a booth for the Tattoo Expo can find the exhibitor form here. Space is expected to sell out quickly. Special Happy Hour And Live Music. A special happy hour party with live music by Corey Stevens, a blues-based rock singer, songwriter and guitarist, will take place in the RiverCentre on Saturday night from 5 p.m. to 7 p.m. Join your friends and make some new ones as you relax and discuss the show. Tickets. On sale at the RiverCentre Box Office, all Ticketmaster www.ticketmaster.com locations, charge by phone at 800-745-3000 or online at www.ticketmaster.com. Children under the age of 12 are admitted free.